I have successfully completed three canning batches using my new Tattler Lids. It was a rocky start...only because I didn't follow directions but once I got it, nothing but sweet success. The first batch of stew did not seal. This was of no fault of the Tattler Lids, just me not taking the time to firmly tighten the metal rims after I removed the jars from the canner. Since the seal and lid are thicker than the standard metal lids, extra care needs to be taken to ensure that the lids are tight to allow them to seal during the cooling process. Word of warning. In my last post, I mentioned that I was concerned that I didn't get the seal laid down properly along the rim of the jar. On one jar, which was hissing when I removed it from the canner, was not properly sealed. I move the metal rim a bit and the pressure made hot soup spray out the side. This again was my own fault and no one was hurt. 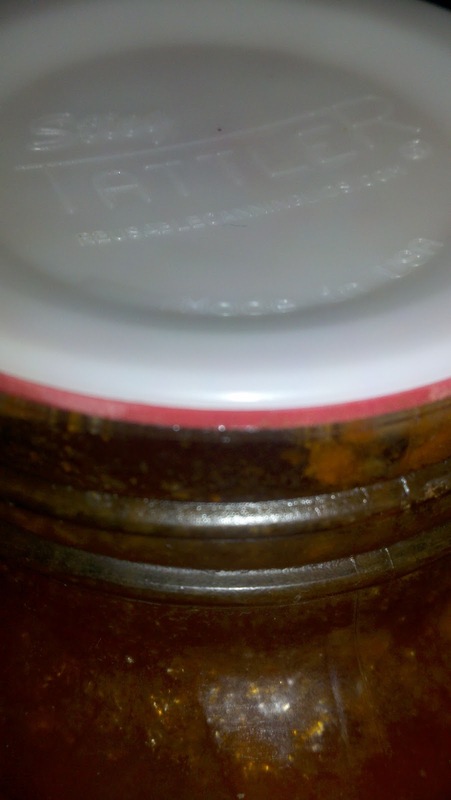 I figured out that the rubber should be placed on the lid, THEN placed on the jar to ensure that it is laying properly. This probably is in the instructions which of course I barely read. The first unsealed batch I cleaned up and sanitized more lids and processed them again. Much to my relief they were firmly sealed when I checked on them the next day. I ended up doing 9 quarts of stew, 7 pints of stew and 5 quarts of beef chunks. All sealed wonderfully. In the picture above you can see what the lid looks like. I'm not sure if it is evident but the lid is indented, indicating that it is sealed. The lid is very thick and since it is made of plastic, the pop noise that we canners love, never happens. However the indentation is quite visible. The red seal also is visible under the lid. The instructions mention that you should use the opposite side when reusing. That the side you used prior will be evident. This portion of the instructions I did read. I can see how Tattler Lids will grow to become synonymous with canning. You know, like Kleenex is to tissue or Bandaid is to whatever they are called. I can hear future conversations such as "How many years have you used your Tattlers?" I admit that they are expensive to purchase upfront. I purchased 240 to start with but after working with the lids and am able to see their durability, I can see that this was an investment that will pay off in the future. Much like spending extra for a good canner. Oh, congrats!!! I love hearing about other people's success in canning, both with a pressure canner and tattler lids. I'm so jazzed to use both of mine this year. I've done chicken stock, but so far that's all. Now I need to go get some of my garden planted and weeded so I can have something to can!!! Vertical Potato tower and garden ramblings.